Credit: Current Biology, Fruteau et al. People could learn a lot from vervet monkeys. When vervets need to work together, they don't tell each other what to do or punish uncooperative behavior. But according to evidence reported on March 28 in the Cell Press journal Current Biology, they do get by, with a little patience. 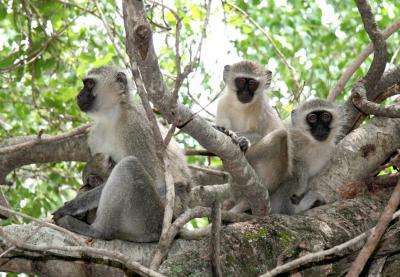 "The vervets show us that tolerance towards group members and patience while others are learning how they can improve things individually can go a long way in solving coordination problems," said Ronald Noë of Université de Strasbourg in France. 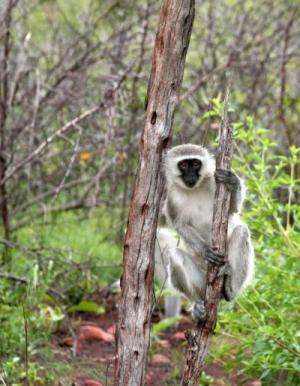 In the study, the researchers had groups of vervet monkeys, two living freely in a South African park and another in captivity in France, play a social game without offering them any training on the game or how to play it. In each "forbidden circle" experiment, a single low-ranking female was trained to open a container holding a large amount of food only when other monkeys dominant to her stayed outside an imaginary circle. If anyone was to get their treats, everyone had to figure out the rules and show enough restraint to follow them. And sure enough, the vervets did. One by one, without any guidance from humans, the dominant monkeys learned to control themselves. As soon as all of them showed restraint, the provider monkey in the middle opened the bin of food right away, saving everyone precious time. Remarkably, the vervet monkeys each learned how to "play" on their own, in order of dominance and by trial and error. Higher-ranking monkeys figured out the rules most quickly because their status allowed them to reach the food dispenser first and to see the provider's response that their actions provoked. With the rules to "back off" understood, those more dominant individuals watched on patiently until each of their peers followed suit. The monkeys showed no evidence of communication or coercion at all. At the beginning of the video, we see a juvenile female next to the tree, the container, and the alpha female (F2) and the beta male (M3) next to the building. The distance between the building and the container is about 12 m. The provider (holding her infant) comes from the left side and quickly approaches the container. She opens it at 4 s. The juvenile female joins her at 5 s. The alpha male (M1), coming from behind the camera, joins her at 7 s. The provider retreats a little, checking where the alpha female is. As the latter is fast approaching, the provider leaves the container at 8 s. She had time to take five pieces of apple. When the angle of the camera widens, the alpha female is running toward the container, at the left of the tree. She arrives at the container at 12 s. In the background, one can see two other individuals running. The beta male joins at 19 s while the third-ranked adult female crosses in the background. Credit: Current Biology, Fruteau et al. Noë said the findings represent skills that the vervets probably use all the time, in coordinating movements for protection of the group or their territory, for example. Their behavior shows that higher cognitive processes, such as insight into the thoughts of others and complex language, aren't always needed to solve complex social puzzles. "These capacities do help us a lot, of course, and the fact that humans are so often confronted with such [coordination] problems may well explain the evolution of language and higher cognitive capacities," Noë said. "But individual learning and a bit of patience while others learn can go a long way too." Noë said he hopes researchers will ask other species, including humans, to play the "Forbidden Circle game" and see how they do, noting that most of what we know so far comes from captive studies in which pairs of animals cooperate. He speculates that impatient baboons and chimps would really struggle. How do you think the children in your life might do?